JFK Assassinated because of the Mafia-Busting work of his brother? The Dallas County district attorney said on Monday that he could not categorically dismiss as fake a transcript of an alleged conversation between Kennedy’s assassin Lee Harvey Oswald and Oswald’s killer Jack Ruby. The transcript is one of many items related to the Kennedy slaying in November 1963 and Ruby’s trial that were found in an old safe in a Dallas courthouse about a year ago and have been painstakingly cataloged. 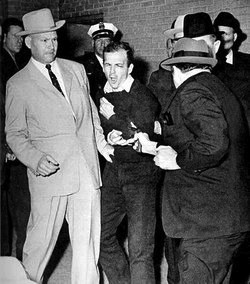 In the purported conversation nearly two months before the assassination, Oswald and Ruby discuss killing Kennedy to halt the mafia-busting agenda of his brother, Attorney General Robert Kennedy. The debate has been open since the second he was shot, Mr. Watkins–Where have you been? Lee: You said the boys in Chicago want to get rid of the Attorney General. Ruby: Yes, but it can’t be done … it would get the Feds into everything. Lee: There is a way to get rid of him without killing him. Lee: I can shoot his brother. Ruby: But that wouldn’t be patriotic. Lee: What’s the difference between shooting the Gov. and in shooting the President? Ruby: It would get the FBI into it. J. Edgar Hoover was the long-time director of the Federal Bureau of Investigation (1924-1972), and close friend of Lyndon Johnson. It is well-documented that before President Kennedy was elected, Hoover rarely acknowledged the existence of the Mafia. Jack Anderson reported on J. Edgar Hoover’s apparent ties to the Mafia, and also the reluctance of the FBI to prosecute it. The Mafia’s financial genius Meyer Lansky had allegedly blackmailed Hoover over his homosexuality as early as 1935. Another probable reason for Hoover’s failure to prosecute the Mob was his preference of easy targets to boost the FBI’s image. After Kennedy became President, the prosecutions of the Mafia by the Justice Department (of which the FBI is a part) increased elevenfold. The Mafia war that started in the late 1950s encouraged Attorney General Robert Kennedy to prosecute the Mafia heavily after 1960. His attacks focused on Teamsters Union boss Jimmy Hoffa and the Mafia bosses of Chicago, Tampa and New Orleans. On May 8, 1964, just days before Hoover was due to give testimony to the Warren Commission, Lyndon Johnson announced he had exempted Hoover from compulsory retirement and appointed him Director of the FBI “for life” at seventy years of age. In the White House Rose Garden, Johnson said, ‚ÄúThe nation cannot afford to lose you.‚Äù Since Hoover’s death in May 1972, the tenure of the FBI director is, by law, limited to a single 10-year term. A couple years ago I devoured a lot of the JFK conspiracy work… this release seems to divert attention away from the most cited reason for JFK’s assassination: the CIA’s interest and connection with building (or at least maintaining the current level) of funding and power. I’m not making any claims, but that side seems to make the most sense to me. I’m sure the Mafia would just go ahead and kill the person out to get them instead of going for his brother. What we read here seems to go against how the Mafia operates. i dont know if this is true i believe that kennedy was shot by a number of people!! !